The Visual Arts department at the South Carolina Governor’s School for the Arts and Humanities encourages the growth of young artists through pre-professional training guided by a faculty of artist-educators. Visual Arts students at SCGSAH develop their skills with broad exposure to practices through a concentrated exploration of a medium under the guidance of an artist mentor. The pieces selected for this exhibition demonstrate the achievement possible through these connections, with work created by students in the Visual Arts program. Also included are the professional works of SCGSAH faculty members. 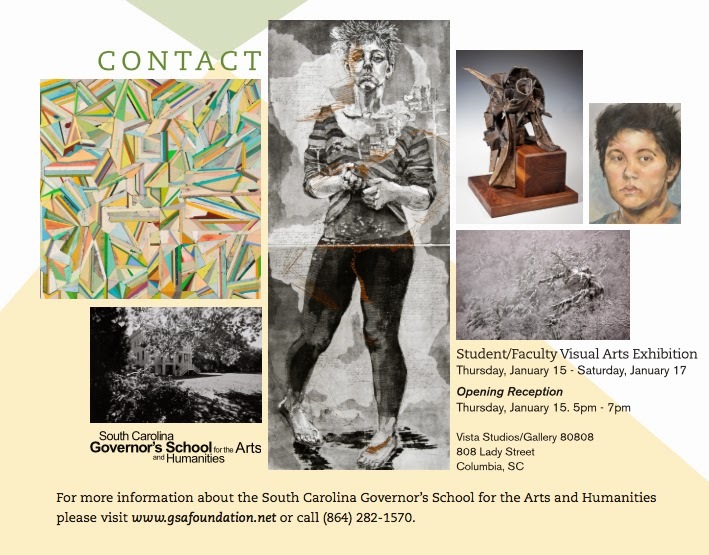 For more information about the South Carolina Governor’s School for the Arts and Humanities please visit www.gsafoundation.net or call (864) 282-1570.